was sponsored by the Wilson Rotary Club. arrived on the scene in alarming proportions. In 1927 the club bought a Boy Scout Camp at Medoc Mountain. In 1938 the Rotary Club built a cabin for the Boy Scouts on the eastern bank of Tar river. Shortly thereafter they built a cabin for the Girl Scouts called the “Little House” in Edgemont. We formed a Student Loan Fund, helping worthy boys and girls in securing an education when otherwise it might have been denied them. During the Depression circumstances were so critically financially, that for some months we tried having our meetings without meals, bringing a picnic lunch, or going out on picnics during the summer. This did not prove very satisfactory since one of the best ways to get a Rotarian to attend meetings is to feed them. We entered into the program of beautifying the City Lake; which was once only a swamp on the western edge of our City. During the Depression many young children in our city schools who were not properly fed breakfast and were doing well in school. of small food to hundreds of children. 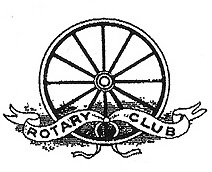 The Enfield Club and the Tarboro Club were organized through the efforts of the Rocky Mount Rotary Club. During World II, Jimmy Grantham, one of our Rotarians, was killed in action in the European campaign. An Educational Trust Fund for his daughter, Miss Joan Grantham, was established. Rotary – provided financial support for the Exchange Student program that brings foreign students to this country to study and sends American students abroad. In the mid ’5O’s the Club began the practice of inviting each week two student guests a boy and a girl, from Rocky Mount Senior High School to attend the weekly meetings. A Rotary Scholarship to be given annually to a deserving Rocky Mount High School Senior was started in 1956.
price they could get. It is rumored that there was a good supply of hot dogs in some Rotarians’ freezers five years later. The Christmas Auction has proved to be a good way to raise funds for worthy causes and projects. The first auction in 1954. The Rotary International Group Study Exchange Program has been supported by our club. In 1970 we hosted six Australians for several days. Again in 1973 another exchange group came from Northern England and spent several days here. Rotarian Ernest Beal, a former president, was honored on his 80th birthday in 1974 with a special program in which many of his friends expressed their admiration and respect for him. In 2013 we celebrated the 100th birthday of Rotarian George Hooks who has been a Rotarian for 69 years and counting. 1959-1960 Mel Warner Elmus W. Pegram, Jr.
1960-1961 Josh W. Munden Elmus W. Pegram, Jr.
1961-1962 Ted Williamson Elmus W. Pegram, Jr.
1962-1963 Don H. Cole Elmus W. Pegram, Jr.
1963-1964 Harold Minges Elmus W. Pegram, Jr.
1964-1965 Alfred L. Stancil Elmus W. Pegram, Jr.
1981-1982 David A. Parker F. Earl Beaudry, Jr.
1982-1983 William B. Floyd F. Earl Beaudry, Jr.
1983-1984 Paul H. Peel F. Earl Beaudry, Jr.
Download some of our old historical documents HERE.